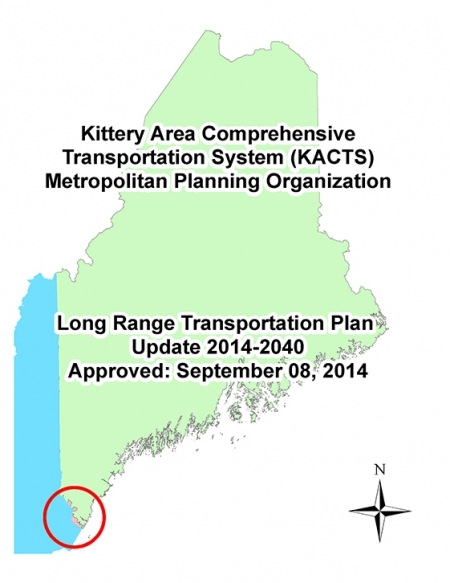 KACTS is the metropolitan planning organization (MPO) for the Maine portion of the Kittery-Portsmouth and Dover-Rochester, New Hampshire urbanized areas. KACTS used the INVEST System Planning (SP) module to score their approved 2010 Long Range Transportation Plan (LRTP) and used the results to identify opportunities to better integrate and showcase sustainability principles in their 2014 LRTP. After drafting the 2014 LRTP, KACTS then used the SP module to evaluate the draft plan and compare the results with the 2010 LRTP. To score the 2010 KACTS, a committee was formed with representation from local municipalities, advocacy groups, Maine Department of Transportation, and the Federal Highway Administration. The committee held an all-day scoring workshop to discuss the criteria in greater detail and reach consensus on the number of points to assign to each criterion. The committee solely evaluated the content of the plan and did not award points for existing activities or programs that were not specifically mentioned. This approach to scoring led to the 2010 LRTP receiving a total score of 17 out of 250 possible points. The scoring results highlighted numerous areas for improvement for future LRTP updates including the need for KACTS to better and more accurately reflect all of the programming that it completes every year. KACTS utilized the results of the 2010 LRTP scoring process to guide and influence the development of the 2014 LRTP. KACTS recognized that the new plan should be more informative and useful for the public to more clearly illustrate their practices, partnerships, policies, and programs that relate to sustainability. As a result, there was a 66 point increase from the 2010 LRTP to the draft 2014 LRTP. This considerable increase in points was mainly due to a change in content from the 2010 to the 2014 LRTP. The table on the next page displays the scores from each plan and the change in scores from the 2010 LRTP to the 2014 LRTP. SP-01 Integrated Planning: Economic Development and Land Use. Although one of the major policies serving as the foundation for the 2010 LRTP focused on strengthening the connection between land use, economic development, and transportation, the plan only included high level goals and objectives in support of this policy. The 2014 LRTP goes well beyond the 2010 plan to provide specific strategies and recommendations to engage partner agencies, offer incentives for development, and establish pertinent performance measures. SP-03 Integrated Planning: Social. The 2010 LRTP offers limited information pertaining to how the plan addresses and advances the community’s visions and goals. In contrast, the 2014 LRTP emphasizes KACTS’ proactive and integrated approach to advance a shared vision and encourage public participation from a wide range of stakeholders. SP-10 Air Quality. While the 2010 LRTP included overarching goals to reduce air pollution and greenhouse gas (GHG) emissions, the plan did not go into detail about multimodal strategies to reduce emissions. Recognizing this gap in the 2010 LRTP, for the draft 2014 LRTP, KACTS identified a specific strategy to reduce (GHG) emissions and air pollution with specific recommendations to promote the use of alternative fuels, reduce vehicle idling, and convert waste hauler fleets to compressed natural gas and/or blended biodiesel. The 2014 LRTP also includes a commitment to inventory, analyze, and tax GHG emissions associated with the transportation sector. The criteria in the SP module helped enrich and improve the Draft KACTS LRTP. The collaborative approach to scoring resulted in productive conversations about the LRTP as well as ways to increase the public visibility of KACTS. The INVEST exercise helped KACTS engage their partners more directly in the details of the planning process and the connections of specific activities to broader outcomes. The SP module’s emphasis on performance measures was very useful in helping KACTS prepare for performance management requirements stemming from the Moving Ahead for Progress in the 21st Century Act. KACTS has recommended improvements to INVEST so that it can more appropriately consider the work of a small MPO.